For a soft, sculpting effect, apply a dash of the Bronze Crème to Powder Blush just below the cheek bone blending back toward the hairline. To make the apples of the cheeks pop, blend Rebecca's Favorite Crème to Powder Blush slightly above the Bronze Crème to Powder Blush, focusing on the roundest area of the cheekbone. Blend back toward the hairline to create a natural gradation of color. Don't forget that our Crème to Powder Blushes also make a beautiful matte lip veil. If you prefer a glossy lip, try our lovely Rebecca's Favorite Lip Gloss. Created for Rebecca Restrepo, celebrity makeup artist. A truly universal shade flattering on any skin tone! 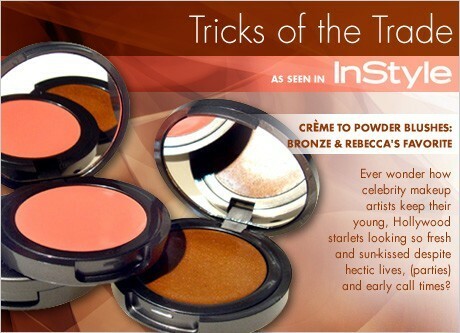 Goes great with Rebecca's Favorite Creme to Powder Blush.